Stith Keiser, BA, is the CEO for Blue Heron Consulting (BHC). BHC’s team of consultants strives to improve the lives of practice owners and team members, enhance client experience, and elevate the quality of patient care. His team achieves this by guiding owners, whether aspiring owners or seasoned veterans, to build sustainable practice profitability. He is also a managing partner in several small animal practices. FUN FACT: Prior to his career in veterinary medicine, one of Stith’s more memorable jobs was as a “trail cook” for week-long horse packing trips into the Teton Wilderness area of Wyoming. On the first day of fall football camp, athletes ranging from seasoned upperclassmen to wide-eyed freshmen were silent as they pondered the coach’s question: How do you want to be remembered? Our answer was important, the coach said, because the decision we made that day and every day forward would determine how we would be remembered. Whether you are an experienced veterinary professional or a student about to begin your veterinary career, the decisions made today define tomorrow. If you want the perfect job—not just any job—first answer this question. What kind of positive mark do you want to leave on the profession—as an excellent educator, practitioner, or practice manager? Is your goal to touch the lives of as many clients and patients as you can? Or to provide the highest level of care with the “gold standard” of general medicine or a specialty? When you have determined what you want to be remembered for, you know where to start investigating opportunities that align with your answer. Find your perfect job at the Veterinary Team Brief Career Center. “Why do you get out of bed each morning … and why should anyone care?” asked Simon Sinek during his “How Great Leaders Inspire Action”1 TED Talk about the importance of finding your “Why?” on both personal and professional levels. On a personal level, your Why may be your role as a significant other, parent, friend, or philanthropist. On a professional level, which need not define you as a person, your Why is the secret to finding the right position and building a legacy. An individual’s Why is often found hiding at the juncture of values and interests, so make one list of your personal and professional values and then a second list of your professional interests and skills. Use both lists to answer the question, Why, professionally speaking, do I get out of bed each morning? This exercise is about more than self-reflection and identifying your motivation and drive. 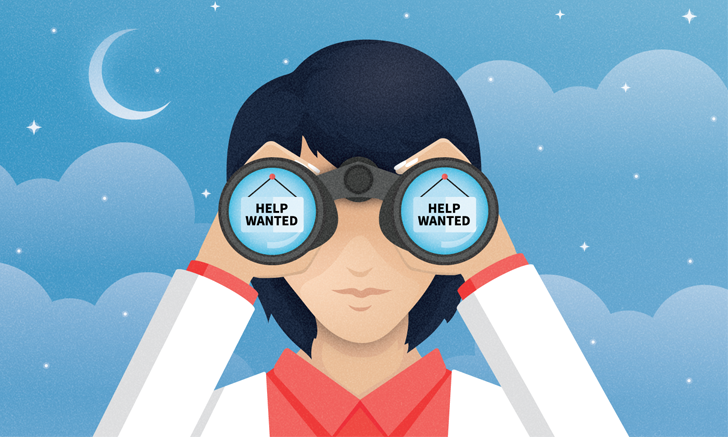 Even a job market that favors job seekers has limited opportunities, and “above average” careers are in even shorter supply no matter the field. Do not be fooled into thinking that because the job market is fairly strong there is no competition for the most sought-after positions. SOURCE: Benchmarks 2017: A Study of Well-Managed Practices. Columbus, OH: WMPB; 2017:131. Remember, if you look for jobs where everyone else does, you will find only what everyone else finds. Author’s note: This list is a small sampling of job search resources and does not imply any recommendations. Make the other person feel important—and do it sincerely. There is a difference between flattery and genuine appreciation. Do not think of networking as striving to meet and know as many people as possible. It is not just who you know, but who knows you. SOURCE: Benchmarks 2017: A Study of Well-Managed Practices. Columbus, OH: WMPB; 2017:133. Now it is time to investigate specific job opportunities. Because the veterinary industry is fraught with turnover,4 it is your prerogative as a job seeker to learn as much about a potential employer as the employer learns about you. What level of medicine does he or she practice? What is the practice business model? What is his or her medical philosophy (eg, if a dog presents with vomiting and diarrhea, is he or she typically sent home with symptomatic treatment and a bland diet to “wait and see” versus running complete blood work, taking radiographs, and/or performing an ultrasound)? Are training, mentoring, and CE opportunities provided? What compensation and benefits will be offered? None of the answers to these questions will be important if the practice cannot financially support the new position. Veterinarians interested in a practice must conduct due diligence on basic practice finances, and those interested in opportunities outside of clinical practice should still understand their value as a veterinarian and how the value is assessed. Sales has traditionally had a bad connotation in veterinary medicine. However, as a job seeker, your goal is to package and sell your experiences, interests, skills, and capabilities to a buyer (ie, the potential employer), so prepare for and approach the job search process as the most important sale you will make in your career. Whether you prefer to call it leadership, negotiation, or client education, veterinary professionals are, especially in the job search process, striving to complete one of the most important sales deals of their career—securing a job. How do you want to be remembered? Coach’s question has resurfaced many times throughout my veterinary career, as it should throughout yours, because how you will be remembered begins with the decisions you make today. 1 Always begin a job search by first determining how you want to contribute to, and be remembered by, the veterinary profession. 2 Treat the job search process as your most important sales job and prepare thoroughly to sell your potential to possible employers. 3 Know that a strong resume and cover letter are still important but that many jobs are found through networking. Sinek S. How great leaders inspire action [video]. TED. https://www.ted.com/talks/simon_sinek_how_great_leaders_inspire_action/transcript. Recorded September 2009. Accessed December 11, 2017. Adler L. New survey reveals 85% of all jobs are filled via networking. LinkedIn. https://www.linkedin.com/pulse/new-survey-reveals-85-all-jobs-filled-via-networking-lou-adler. Published February 29, 2016. Accessed December 10, 2017. Carnegie D. How to Win Friends & Influence People. New York, NY: Pocket Books; 1936. Zimlich R. Tackling turnover. dvm360. http://veterinarynews.dvm360.com/tackling-turnover. Published August 1, 2008. Accessed December 10, 2017.